HomeColoradoTwo great new sources of data! 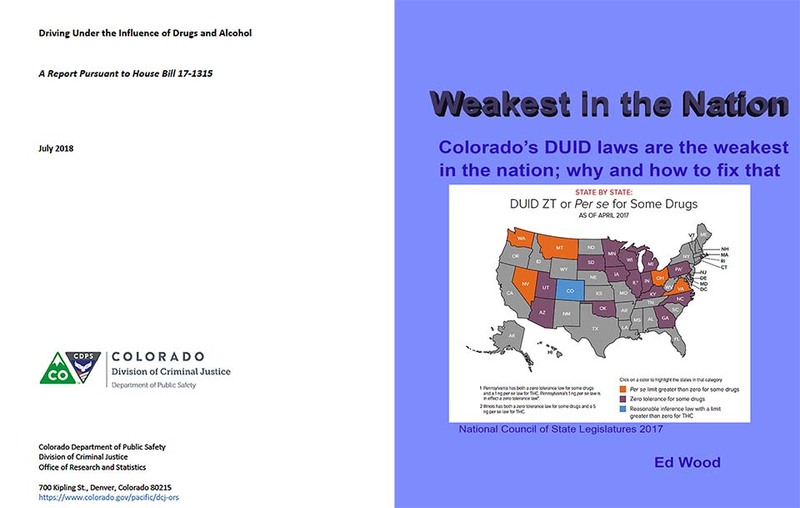 Due to inadequate drug testing, Colorado cannot fully understand the scope, causes, and consequences of DUID (only 15% of DUI suspects are drug tested). Colorado’s 5 ng/ml THC permissible inference law makes it harder to convict most marijuana-impaired drivers. Second, our book Weakest in the Nation, described in the attached press release (and its attached Executive Summary) explains in detail why this is occurring in Colorado and what should be done about it. The book is available on Amazon for $5. The two publications provide rich detail of facts about drugged driving in Colorado, thoroughly documented. Naturally, that makes quite a bit of material to wade through. The DCJ report is 102 pages and Weakest in the Nationis 159 pages. The two-page Executive Summary is an easy introduction to the book and the attached single slide summarizes the key points of the DCJ report that DUID Victim Voices finds compelling. DCJ plans to offer a “dashboard” presentation of their data later in the month. The DCJ report is the result of a great effort on the part of a very capable team of people. We are grateful for their work, which is, as far as we know, the first time large scale data have been published describing the drugs causing DUI arrests, not simply the presence of drugs involved in fatal crashes. What are the causes of DUI charges in cases where drivers were tested for both alcohol and drugs? This would enable us to produce a chart similar to the one created based upon the report published in May by the Washington Traffic Safety Commission. Distinguish between convictions for DUI and convictions for DWAI.The DCJ report combined these two, which is why the report shows 73.8% of those testing between .05 and .079 BAC were convicted. DCJ agrees that it is highly unlikely they were convicted of DUI, but rather were part of the 9.7% of DUI cases that resulted in a conviction of DWAI. The same is likely true for those drivers who tested below 5 ng/ml THC as their only impairing drug. They too were most likely convicted of DWAI, rather than of DUI. See the September 17, 2018 post to see the results of this work done by DCJ.